It's time to thrive! Back to Our Roots is a 3-week challenge to add a wide variety of plant-based foods to your meals and snacks. The goal is for participants to explore new plant-based foods and enjoy more of their old favorites. During the challenge, participants will log the different kinds of plant-based foods they eat in their Personal Online Tracker. They'll also receive helpful nutrition tips and information from Healthy IU. Back to Our Roots is not about depriving or cutting out any foods that you currently enjoy. Just make sure you leave room for all the plants you'll be trying! Note: If you are currently following a special diet as part of the treatment or management of a disease or condition, please speak with your doctor before participating in the Back to Our Roots challenge. Learn more about Back to Our Roots below! Why Focus on Plant-Based Foods? Often times, people think that improving their diet means eating less of certain things or overall. By focusing this challenge on plants, we are able to have a focus of more, not less. We hope you feel great about including more of something in your diet! 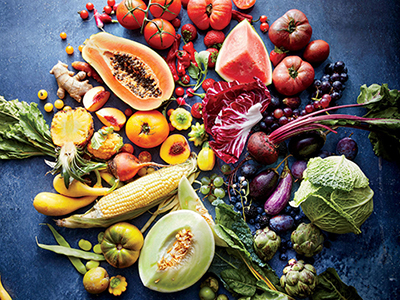 Every plant food contains a unique combination of health-promoting compounds called phytonutrients. There are literally thousands of different phytonutrients found in nature, and eating a variety of plants is a great way to include more of them in your diet. The fiber contained in plant foods feeds the beneficial bacteria in our digestive tract (gut bacteria). Eating a variety of plants helps to promote a healthy diversity of bacterial species. Plants are a great source of many essential vitamins and minerals. Just like with phytonutrients, you can't get everything you need from just one or two plants. Whole plant foods are great for our minds and bodies! They have been shown to help us reduce risk of chronic disease, and improve mood and overall quality of life. Participating in Back to Our Roots is as easy as 1-2-3! Look for an e-mail from Healthy IU on April 2, 2018, the first day of the challenge. The e-mail will have a link to your Personal Online Tracker. During the challenge, April 2-22, log the different types of plant-based foods you've eaten in your Personal Online Tracker. If you'd like a tracker you can print out and keep handy, you can download it here. Just be sure to update your online tracker, too! If you have any questions, don't hesitate to contact us at challeng@iu.edu. Host Your Own Plant Party! Your department or group can host your own Plant Party anytime. Choose a date, time, and location convenient for your group. Pass around the Pitch-In Sign Up Sheet to your group. Make sure to share this flyer and/or this presentation about the power of plants! Host your Party and HAVE FUN while you discover delicious plant-based dishes. Take photos at your Plant Party, or make copies of your favorite plant-based recipes, and send them to challeng@iu.edu so we can share with other participants! These recipes can help get your party started! But feel free to make your own favorites!